The cow on exhibit in Leonia on Broad Ave. next to the post office, was painted for the CowParade 2007 West Hartford, CT. I call the cow Meissen Cow because the design was painted as exactly as possible to represent the Meissen Blue Onion Pattern. In essence, my vision was to create an image of a giant porcelain cow. The white background is the white of the material from which the cow was manufactured. There are only two added colors – gold and blue called Smalt hue. The blue paint is fairly transparent, and many layers were required to obtain a depth of color. CowParade is and international public art exhibit that originated in Zurich, Switzerland in 1998. The first US CowParade was in Chicago, followed closely by an exhibit in New York City. Most of the artist for each CowParade are local artist, as transporting an adult size fiberglass cow over large distances is costly. Artist paint and sometimes re-sculpt or add sculpted images to their cows, and these works of art go on exhibit in different cities throughout the world. After being on public display for several months, the cows are sold at CowParade auctions; the money raised goes to a variety of charities. 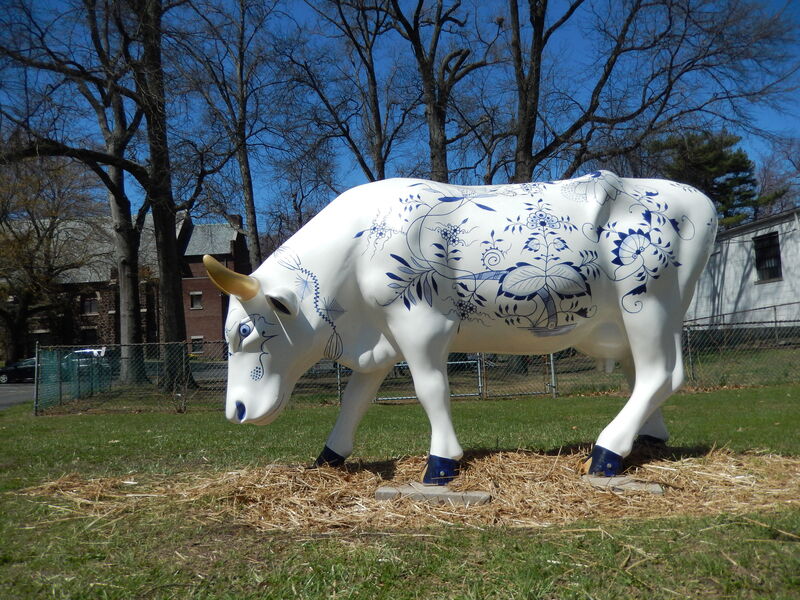 I have painted three cows for two different West Hartford, CT CowParades. I do not intend to paint any more, as by profession I am not a cow painter. I am however a prize winning artist and mostly create pieces in mixed media. For now my husband and I live in Connecticut. In a year we will be moving to Englewood to live near our Leonia based son, his wife and their three children.